WORLD SERIES: High Pressure Front Headed to K.C. 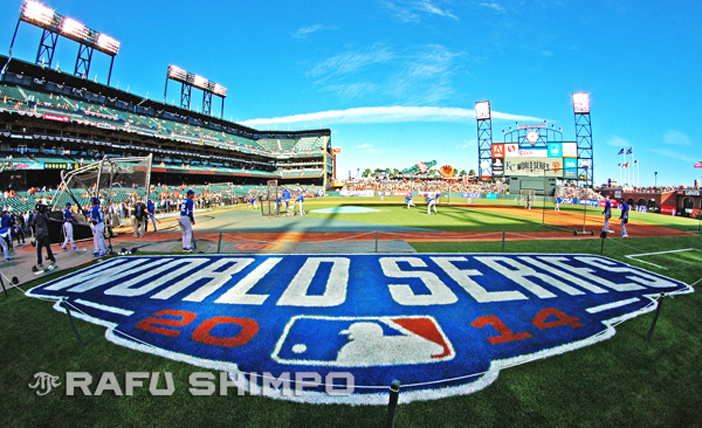 You are at:Home»English»WORLD SERIES: High Pressure Front Headed to K.C. The wild 2014 edition of the Fall Classic shifts back to Kansas City, with the Giants ahead and looking for yet another title. SAN FRANCISCO.–After a fairly disheartening 11-4 loss to the Giants in Game 4 of the World Series on Saturday, Kansas City Royals bench coach Don Wakamatsu had no loss of confidence, smiling broadly as he left the visitors’ clubhouse at AT&T Park. “We knew this was going to be tough going in,” he said. No word on whether that smile remained on the plane back to Missouri, after the Royals fell again to San Francisco on Sunday night and now trail in the 2014 Fall Classic, three games to two. The Royals got a solid performance out of James Shields in Game 5, as he allowed only two runs in six strong innings. Unfortunately, his opposite number was simply sensational. Giants lefty Madison Bumgarner continued a storybook run in the postseason, throwing a complete-game shutout in the 5-0 win, his second victory of the World Series. After the Royals’ win on Friday had given them a two-to-one series lead, several reporters peppered Giants manager Bruce Bochy about moving up Bumgarner’s start one day, having him pitch on short rest in a pressure situation. 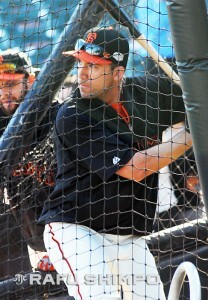 Bochy was adamant in his confidence in Ryan Vogelsong, who was scheduled as the Game 4 starter. The right-hander wound up suffering an ignominious meltdown the following day, lasting less than three innings, thereby – at least temporarily – making Bochy look as though he had miscalculated. The Giants, however, haven’t won two of the previous four World Series out of panic. Bochy is a masterful tactician, and he has the personnel to back up a pitcher who has a poor outing. Strong relief and some suddenly reawakened bats led the home team to an 11-4 rout of the Royals on Saturday, leaving a fair amount of concern for the visitors. 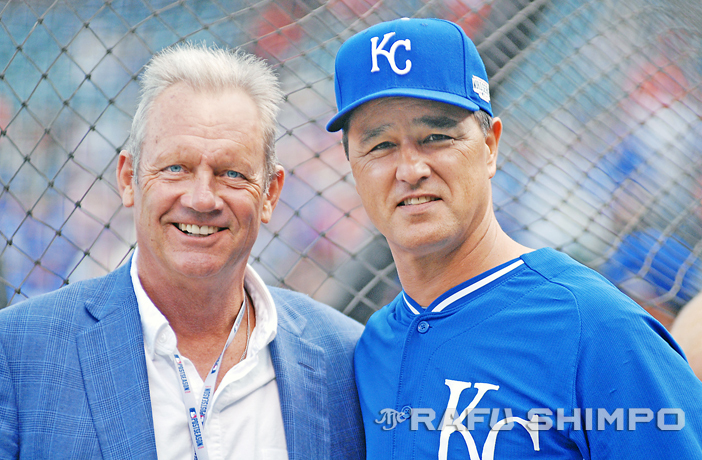 Bench coach Don Wakamatsu, right, meets with Royals legend George Brett. The Royals’ playoff run to the Series was characterized by stolen bases and fundamental station-to-station strategy. In the middle three games of this World Series, however, the Giants’ pitching – and some unlucky bounces for the Royals – largely kept their running game at bay by the Bay. After Saturday’s win, Giants first-baseman-turned-outfielder Travis Ishikawa said his team’s approach hasn’t changed from trailing in the series to being tied. “It’s been the same attitude all year,” Ishikawa said. “We’re a team that no matter what, we’re not going to give up until there are just no more games left to be played. “It’s a lot of stress, but a lot of fun,” he added. Ishikawa has likely become a permanent fixture of Giants lore, after his home run against the St. Louis Cardinals in the ninth inning of Game 5 of the National League Championship Series secured the pennant and sent San Francisco back to the final round. Asked if he thought about the possibility of being celebrated for that swing at Opening Days and old-timers’ games for years to come in San Francisco, he let out an unguarded laugh. Frank Burke, the man who caught Ishikawa’s historic home run ball, has been enjoying a fair amount of fame of his own. After returning the ball to Ishikawa, Burke has been sought for interviews, received World Series tickets and threw out the ceremonial first pitch at Friday’s game in San Francisco. 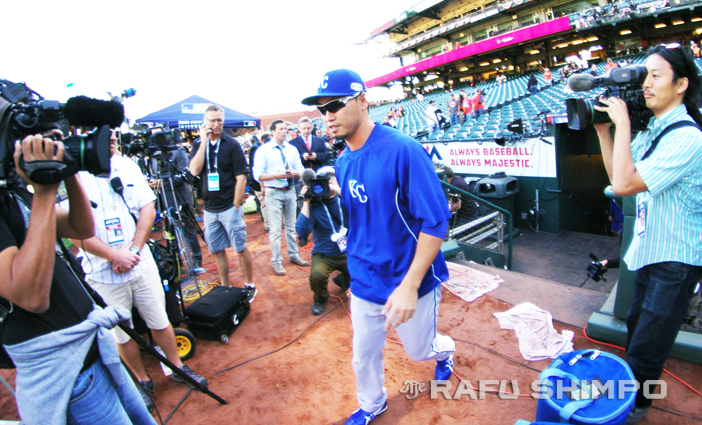 The Royals’ Nori Aoki takes the field fpr pre-game warm-ups at AT&T Park. Game 6 of the World Series will be played tonight in Kansas City, as will Game 7, if necessary, tomorrow. The Royals will start hard-throwing 23-year-old rookie Yordano Ventura, against Jake Peavy for San Francisco. After Saturday’s game, Wakamatsu said his team was comfortable with their starting pitching, hoping to get six good innings from them, then turning the game over to their outstanding bullpen. For fans of Kansas City, those words have a new sense of urgency.